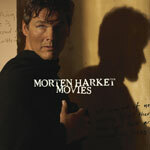 The first track from Morten's album "Letter From Egypt" is the 1-track single "Movies" (3:51). The cover of the card wallet sleeve features a shot of Morten's top half standing by a wall. Morten's shadow is prominent on the wall, facing the right hand side. The title is printed in white letters in the centre of the sleeve. Some cut off lyrics appear hand written at the top left and bottom right of the sleeve. 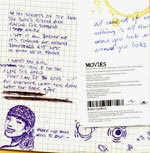 The reverse of the sleeve features some hand written lyrics written on squared paper and a picture of a woman's head, also drawn on the squared paper. There is also a coffee stain in the top right hand corner with some more lyrics written on a piece of white paper. Below this are the track information and catalogue number printed in black. 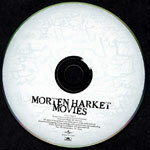 The disc is pale grey with darker grey hand writing all over. The title and other text is printed in black letters at the bottom. The single was available for download in Germany from 16 November 2007.